Randy considers Ideath a four knot boat. That means, on long passages, instead of outrunning foul weather, she must endure it. In her lake sailing days, Ideath’s main cabin took up most of the interior. For safety at sea, Randy divided it into two compartments. To keep the cabin from flooding in case the hull was punctured, Randy installed a watertight bulkhead just aft of the mast. An oval opening in the bulkhead allows passage from the main cabin to the forepeak. Nights offshore, Randy closes this opening with a watertight hatch. If the hull is breached, the bulkhead should keep water from flooding the entire vessel. 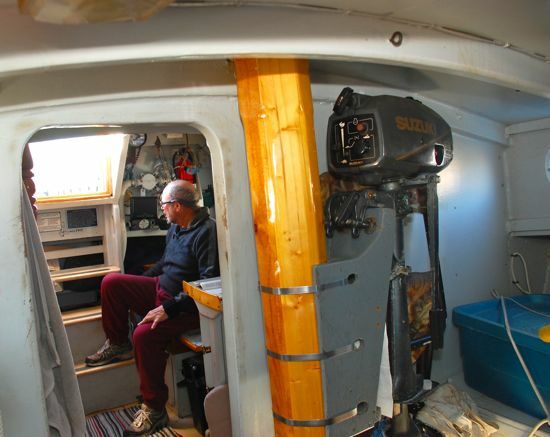 Looking through the watertight bulkhead from forepeak in to the main cabin. He also designed and fitted a watertight companion way hatch. Only twice, when the seas ran taller than 15 feet, has he deployed it. Somewhere along the way, he installed an inboard engine. The watertight companionway hatch stored under the cabin table. 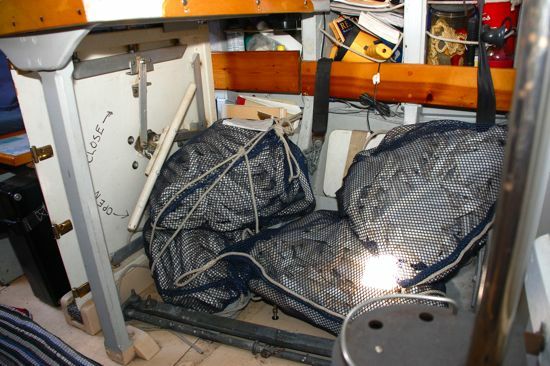 Coiled in mesh bags next to the hatch is a series drogue. The drogue, deployed over the vessel’s stern, slows the vessel in storm conditions. Randy hasn’t needed it yet. Though these improvement might suggest a confrontational relationship with the sea, Randy sees it otherwise. It’s only then that his mind grasps the enormity of the universe. The simplicity of life away from land where all that really counts is flowing past Ideath’s hull and rigging– the waves, the moon and the sky. And the stars. Especially the stars. They’re “amazing” far out at sea, amplified by a clear mind. Undiminished by light pollution. It’s been 30 years since Randy discovered Ideath’s skeleton under a tarp in High Point. He’s 64 now. Together, they’ve sailed 23,000 coastal and ocean miles. 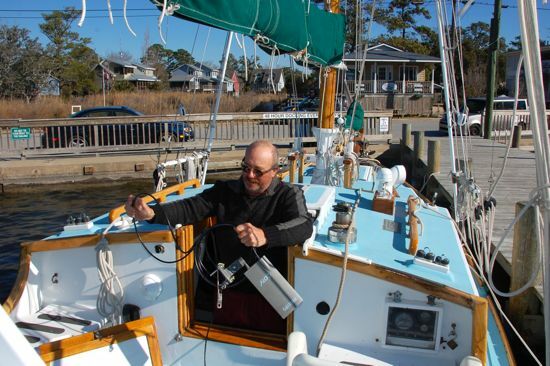 Out of mind are thoughts of building the perfect steel offshore sailboat. Ideath, with her plywood hull, inner tube flotation and home made mast, will take him anywhere he wants to go. Randy departed Oriental without saying where he was going. He just told one of his visitors, “time and tide wait for no one” and left. He dreams of sailing to Norway.